I spent about 4 weeks building this table and now i get to have a real table in the house. I decided to make a drop-leaf table because there isn’t much space for a big table to hang out in the house, plus we rarely need a formal dining table, so it’s nice to have the option tucked away at the edge of the kitchen. I really like how the beveled table top turned out, as well as the swooping curves in the base, even though they were a pain to make. Here’s a pair of nightstands that I built for my sister and her husband. It’s been a long-time coming, but I’m proud to make it this year’s Christmas present. 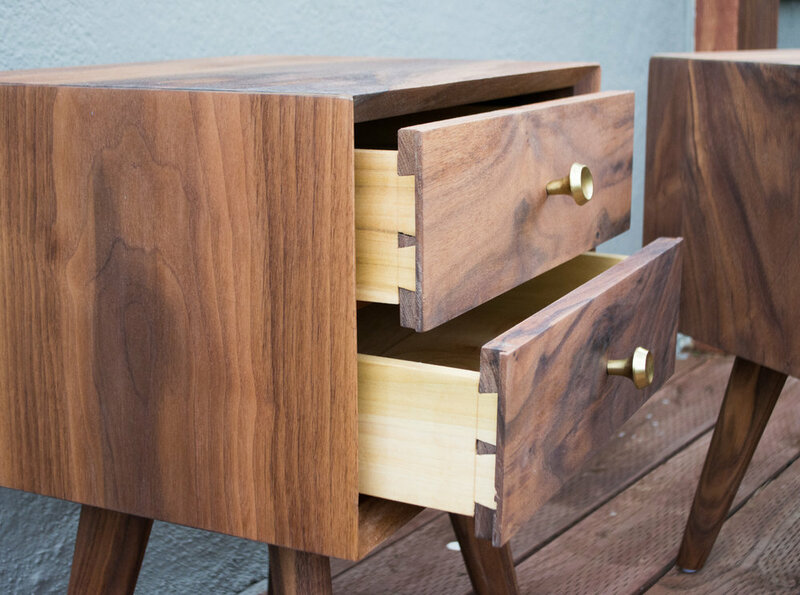 The nightstands are made from walnut with hand-cut dovetail drawers. (That was my first attempt at cutting dovetails.) She finished it off with brushed brass knobs from Anthropologie. I wish I could have video-taped this process, but I started so long ago, before I began filming YouTube videos. I’m also hoping to get better photos when I find a sunny day. TOOLS: Lots of different tools. Please skim the following steps and see if you can substitute my tools for what you already own. TIME: 2-3 days to build the honeycombs depending on how many, plus 2-3 days to stain and finish (and wait to dry), plus 1 half day to hang. GOAL: To put together a hexagon shape from six pieces of wood with a groove in the back, stick on a mirror and plywood backer, and hang the assembly with hanger brackets. I recommend making these hexagons with side lengths between 5 and 9 inches and depths between 2.5 and 6 inches. (I made one that had 11-inch sides and over 7-inch depth. That’s too big.) For this project, I built six honeycomb shelves in a variety of different sizes. I used 5/4 White Oak boards from the hardwood supplier. 5/4 boards are a little over an inch thick and I wanted the edges to look pretty solid for the size of the hexagon. 4/4 or 3/4 wood seemed too thin. The boards I bought were not perfect, though, so I needed to plane and sand the wood first. Decide how deep you want each shelf to be and rip the boards to width with a table saw (or circular saw). I recommend choosing depths of 2.5 inches to 6 inches. With my router in the router table and a 1/2 inch straight bit, I carved out a groove for the back of the shelf where the 1/8” glass mirror and 1/8” plywood will go. (Make the cut in several passes, it’ll be easier than forcing through a deep cut.) The depth of the groove (from the back face) should be about 1/4.” The width (from the inside faces)should be big enough to rest a mirror without it falling through, but less than half the width of the wood, because you’ll need space for the hanger bracket holes. Set the miter saw to 30 degrees to cut the six pieces of each hexagon. There should be a 60 degree angle on each end of the piece. Getting this angle perfect is imperative. 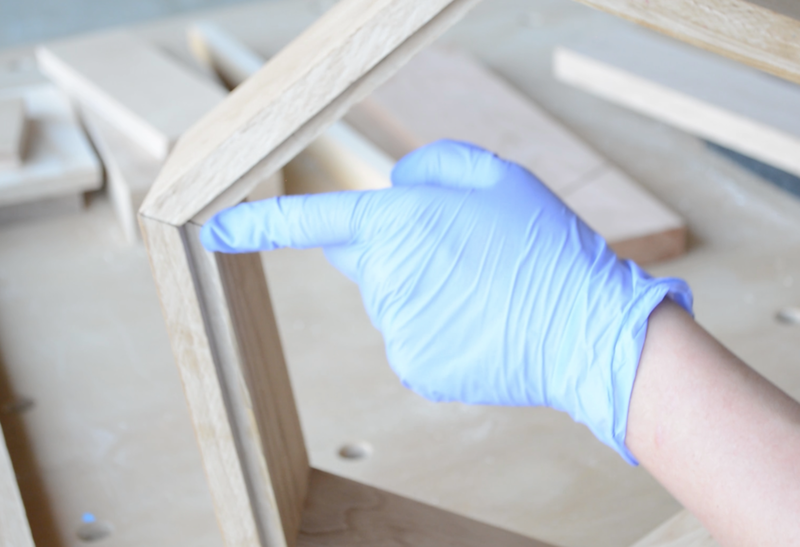 It’s worth it to do a test cut first and measuring, or assemble one shelf and then make adjustments as needed. To prevent the miter saw from tearing out the wood through the back, use a scrap piece of wood behind the cut. Make sure the scrap piece touches the fence on both sides of the gap. I struggled to find a good system to clamp the wood when I had a short piece to cut. I tried everything I had. Perhaps you will find a system that works for you. The important thing is that the wood does not shift, move, or lift off the table when you’re cutting. You may also be able to make the same cut using a table saw or another tool. Before glueing up the assembly, I pre-finished the exposed faces with Teak Oil. This is to repel the eventual glue squeeze-out. It worked well. Any finish that I apply after that should be oil-based. Do not finished the faces where the glue will go, but do finish inside the groove where the mirror will go. I noticed afterwards, that you can see inside the groove in the mirror’s reflection. Apply glue to the edges, create a rough hexagon shape, and slowly tighten a ratchet strap around. These ratchet straps cost me $15 for 4 straps at Home Depot. There are more expensive straps out there, but cheap ones work fine. Straighten out the edges and measure across from corner to corner to get the hexagon even. Wipe the glue squeeze-out as you go along with moist paper towel. Leave the assembly to dry for a few hours or a day. When the assembly is dry, sand the outer faces and front face and check for gaps. 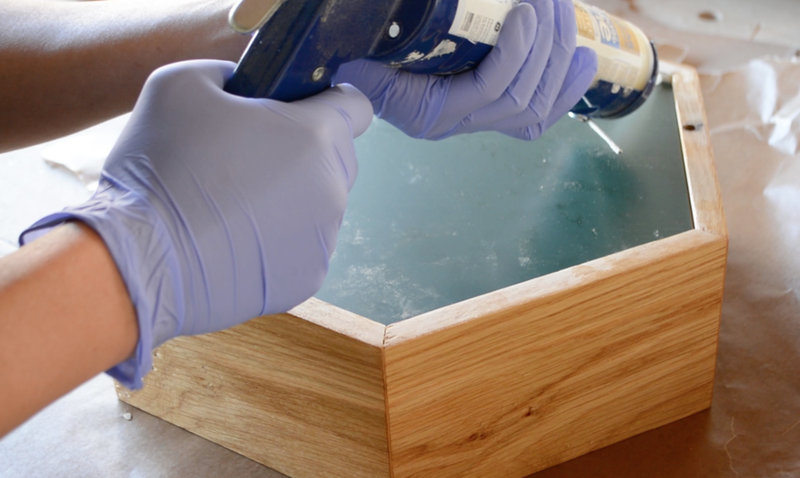 If there are gaps, you may want to fill them with wood filler in a matching color, which will require time to dry. Always good to test the color first. I purchased 3 inch by 1/4 inch hanger brackets from Rockler Woodworking. You can also find these in a hardware store in the specialty hardware bins, but their stock is thin. Better to buy the eight-packs from Rockler (in store or online). The hanger bolts can go almost anywhere in the back, but I chose to place two of them, one at 10 o’clock and the other 2 o’clock, approximately. I used a doweling jig to get a centered, straight hole. But that’s because I don’t have a drill press yet. A plunge router might work. The important thing is to make the hole perfectly straight down. Place the hexagon on a sheet of 1/8” plywood and trace inside the groove with a pencil. Cut out the shape with any tool you like, keeping within the pencil line. Doesn’t need to be perfect. I used a jigsaw and made sloppy cuts. Place the hexagon on a piece of 1/8” glass mirror. You may align one of the inside edges with a finished edge to save a cut. Trace inside the groove with a marker, but don’t mark the wood. Cut along the lines, but make sure that the final piece is not bigger than the space you’re putting it in. Err on the small side. You will need a glass cutting tool, which can be purchased at a hardware store for $5. To cut the mirror, place a non-slip straightedge along the line. I used a wide wood board, but a ruler with cork backing is fine. Dip the cutting tool in lubricating oil, and score a line. Start with the cutting tool close to your body, push down hard on the thumb press part of the tool, and score one straight line all the way across, keeping pressure throughout. DO NOT RETRACE THE LINE!!!!! This will screw up the snap. Then place the scored line over a dowel, take a deep breath, and press down on both sides of the line. It should snap straight. If it doesn’t maybe you can nip at it with pliers, but it’s probably a good idea to just practice a few more times on scrap pieces. I went through double the amount of material I thought I’d need, but by the end I was snapping all six sides without screwing up. Resist the urge to install the mirrors, and finish the wood first with desired coats of oil, stain, or polyurethane. This may take days. I sanded with 600 grit sandpaper after the polyurethane dried for a satin smooth finish. Clean the mirror with glass cleaner, and place it inside the groove. Squeeze caulk around the edges to hold everything in place. Clear caulk works well because it’s flexible, dries in 30 minutes, and is clear when dry. Any kind of adhesive that holds its shape and is somewhat flexible would work. Then stick the plywood on the back. Finally. Create a loose layout for how you want to hang these shelves. You may need the flexibility later on. I started with the big one in the middle and worked my way out. Draw a level line on the wall with a pencil where you want either the top or bottom of the hexagon to land. Next, stick the hanger bolts into the holes in the back of the shelves to use to mark the walls. However, instead of trying to mark the walls with long bolts that can move around, I bought two shorter bolts of the same diameter from the hardware store, and used those to mark the wall instead. Shorter bolts will make a more accurate mark. Line up the hexagon to the pencil line and press the assembly into the wall, making impressions with the pointy ends of the shorter bolts. Drill holes into the wall at the marks and place anchors inside. Pick a drill bit that seems too small for the anchor size. It will create a tighter fit, which is important because there will be a lot of pushing and pulling and we don’t want to lose the anchor inside the wall or rip it out. (I did this several times.) 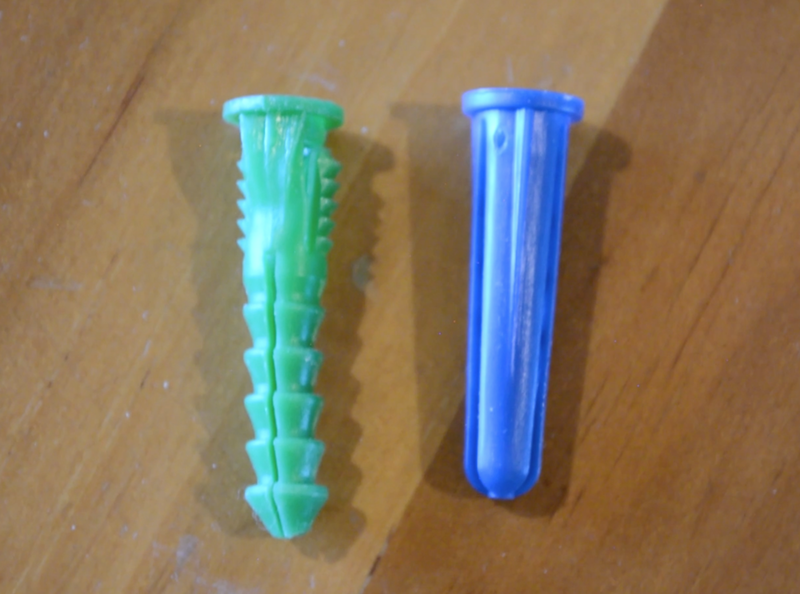 Also, choose the green anchor with ribs, not the blue smooth ones. Sometimes when drilling the hole, you may hit a stud, or worse, the side of a stud. If you want to use the anchor, still, widen the hole behind the drywall to make space for the anchor. Tap the anchors into the wall and screw the long bolts into the anchors, pointy side in, using pliers. Make sure to keep he bolts perfectly perpendicular to the wall. Slip the assembly onto the bolts. If it doesn’t slide in, the holes are probably too small and can be widened. Be careful of the glass mirror though, when attempting to cut a bigger hole. Or, the bolts are not aligned, in which case, you may be able to straighten them out. If the bolts are grossly misaligned, then you may need to pick a new spot and start over. Lastly, if the shelf sticks out a little bit because the collars of the anchor stick out where you mounted the shelf, then you can stick a rubber or cork bumper on the low side to even it out. Today I finished hanging six honeycomb shelves. 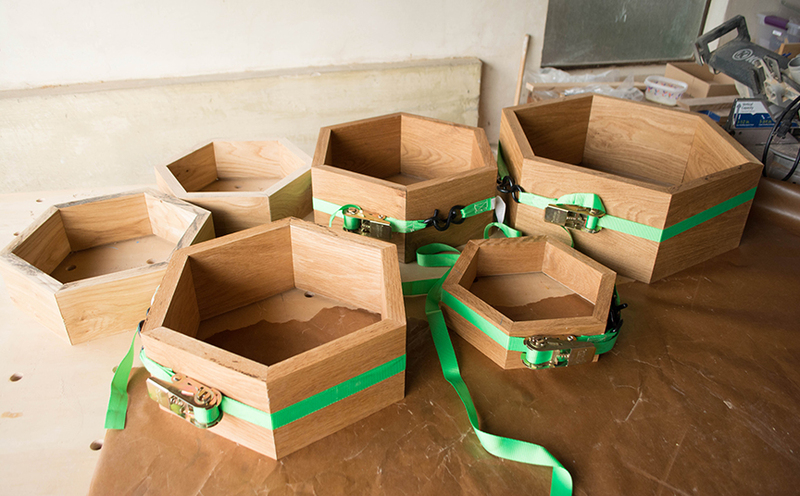 I began building these one week ago, spending at least 3 full days in the woodshop cutting the wood and building the boxes, and several visits to paint the finish and finalize assembly. This project was definitely a stretch for me in terms of getting perfectly fitted angles and cutting glass mirror for the first time, but it was worth the patience. Right now I’m working on the video that details how I built this. It will be a three-part series because there is a lot to go over as well as some repetition of steps where I made improvements. I put my first how-to-build video up on YouTube today! It took me a week to edit and I hope to be getting faster at this. Please check it out and check back frequently. I’m working on my second video currently and I promise it will be even better than this one. After a moody winter, I emerged in spring of 2018 and realized that I needed a proper table to build things. Prior to having this table, I had been working on the floor, on sawhorses, on fold-out tables—and that was suitable for job-site construction projects with lax tolerances. 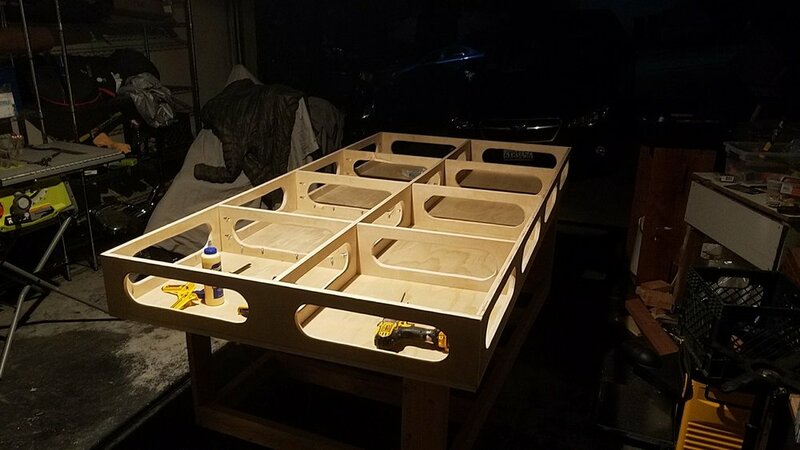 I watched dozens of YouTube videos and was most excited about building a modified Paulk Workbench. Look it up—there are many cool versions! My workbench/assembly table is 4ft x 8ft. The height is about 3 ft, which is just a tad lower than my table saw, so it serves as a perfect outfeed table as well. The top and bottom are separate, held together only by friction and gravity, which is sufficient, and allows me the flexibility to easily transport the table if I ever have to. I love all of the pockets below the surface where I can store small clamps, bench cookies, vacuum attachments, whatever. I have a lot of clamping options through the holes and off the edge. Recently I installed a twin-screw vise that I saw from a Jay Bates video that allows me to do so much more with hand tools. The whole thing sits on casters so I can wheel it around the shop, which I do often. I used some leftover casters that I had from a wire shelving kit. They work fine, but the brakes are a little awkward to engage, which is why I bought nice casters for my Planer Cart that I built later that year where the caster brake levers stick out more so I can step on them. Building the assembly table. Watching glue dry. The whole project cost about $200. I think the plywood came in at about $40 a sheet for nice 3/4” plywood. I used maybe 2-3 sheets for the top, sides, and insides. The wood structure below is basic construction lumber, probably $30 worth. The plywood at the bottom of the table and the base is a cheaper grade of 3/4” ply, which was about $20 each. I was able to build most of it myself in three days, but had my brother and my partner in the shop at times to help me with the heavy stuff like carrying the assembled top and squaring the torsion box and boring stuff like making hundreds of pocket holes for screws. (Sorry, Darius!) My partner also helped me cut out all the little holes on top with a Forstner bit, which is tedious, but it turned out fine even though she had no prior experience operating a drill. For the past six months, I’ve used this table almost everyday and it’s been a worthwhile investment! I built a stand/cart for my Dewalt Planer. That heavy beast lived on my floor for almost a year and I’ve had to drag it out every time I wanted to plane a board. Video coming soon! This basic cart was built using scrap 3/4” plywood from other projects, $5 worth of douglas fir wood studs, extra hinges that I had lying around, and four nice $10 locking casters that I felt like splurging on. It’s very simple: an open box on top, a box on bottom, four legs and a fold-out shelf. It’s sturdy and doesn’t tip over. I chose the height such that it would spit out wood right onto my assembly table, which is around 3 feet high. The width is about the same as the planer and the depth is longer than the base of the planer, about 2 feet, for stability. We just moved into a new house and needed a place for all of our karaoke equipment, speakers, cable box, wireless router, etc., so I built this media console in a day. I had been researching wall-hanging units, because I wanted to float it above my partner’s wrestling mats, which took up most of the living room and was also our only sitting area at the time, but they were expensive! I was looking at $1,000-$2,000 units and they probably wouldn’t fit our stuff anyway. My media console cost under $100. I built it out of poplar wood using pocket hole screws and glue. I measured my equipment the night before, bought the wood the next morning, and built the console in a day. It took a couple more days to stain and topcoat, though. I screwed it directly into the wall, not bothering with any sort of cleats or brackets. If I could do it again, I would have been more careful about the glue squeeze-out. Part of the reason for the dark stain was to hide the dried-gluey parts where the stain couldn’t penetrate. Also, I would have cut larger 2-inch (instead of 1-inch) holes in the divider panels to allow electrical wires and plug ends to slide more easily through. I had to make the holes larger after installing the console, which was awkward.